You recently installed brick pavers in your driveway a few months ago and now that it’s hurricane season, you’re concerned about the potential impacts that stormwater can have on your pavers. Floods occur all over the country, therefore, property owners need to make sure they’re prepared to handle the aftermath. If you’d like to learn more, read part two of this article. During a major weather event such as a hurricane, the volume of storm water produced can create many problems for you. Aside from damage to your home or vehicles, stormwater can create localized flooding on your hardscapes in your driveway, patio, or decks. Repairing these things can be expensive. This can be especially problematic if you live in an area that is prone to flooding.You could also find yourself in need of a paver restoration in Wesley Chapel, FL if things get too bad. The expense of repairing your pavers depends on the extent of the damage. Simple cracks will cost significantly less than repairing uneven pavers, but tearing out your entire patio and replacing it is even more expensive. Weather conditions can cause your pavers to expand and contract. An influx of water that sits for a long period of time can damage your paver surfaces by weakening the cracks or chips already present. If your pavers are already loose, they may collapse. Flooding can also lead to erosion when soil and rock are transported and deposited into the area. When designing your patio, driveway, or any area you plan to install pavers, it’s important to account for proper drainage across the structure. If surface or subsurface water isn’t drained effectively, the water can causes erosion. When installing your patio, properly lay the base to prevent your pavers from sinking. Slope the base of your patio to allow gravity to drain the water. Installing your pavers at a slope can keep flood waters from pooling underneath the pavers. Install a drywell to transfer excess surface water deeper into the subsoil but test your soil (perc test) first. If the water is left to sit, it can cause your pavers to recede and become uneven. 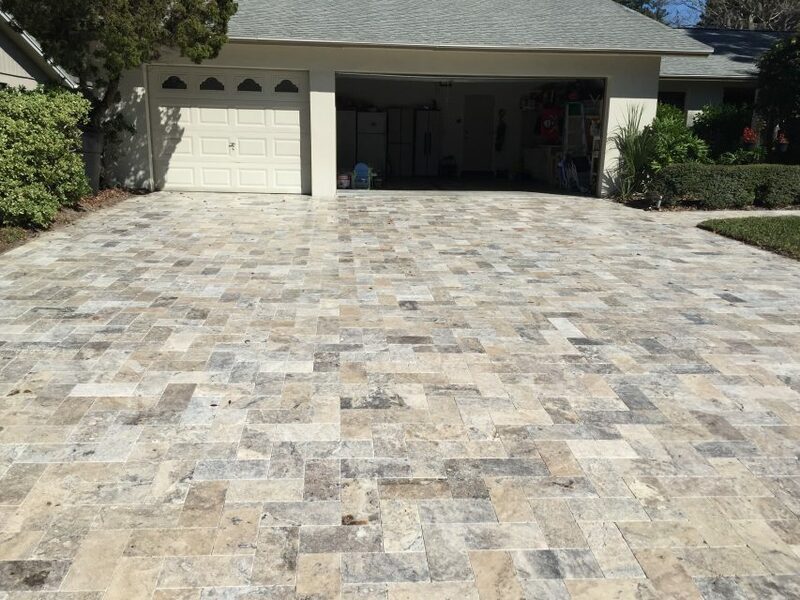 Taking the time to get a paver sealing in Wesley Chapel, FL with a joint stabilizing sealer can help prevent sand loss which also helps to prevent your pavers from shifting. To schedule a paver restoration in Wesley Chapel, FL, please fill out our contact form or give us a call at 813-333-1709.